Majestic Lake Champlain Família Home-Pvt Beach, Dock, Pôr do Sol, Relaxamento e Diversão! Espaçoso 4 quartos, Family Friendly / Pet Friendly Home, com praia privada, Dock, ar condicionado, cozinha bem equipada e sala de jantar completa. Esta propriedade é adequada para grupos de 2-12. Esta propriedade aconchegante, mas espaçosa, está localizada em uma unidade privativa na encantadora cidade de Addison. Perto de tudo absolutamente ainda isolado o suficiente para desfrutar de seus momentos familiares. Enorme grade ao ar livre, (2) caiaques, brinquedos de água e (2) bicicletas de montanha no local permitindo a exploração de terra e lago durante a sua estadia. Dock é adequado para a maioria das embarcações de água com vários acessos de barco nas proximidades da propriedade. Experimente incrível natação, pesca, ciclismo, passeios de barco e vistas Adirondack / pôr do sol para o seu prazer. Muitas melhorias de propriedade previstas para a temporada de 2019 também. Atrações dentro de 10 minutos incluem um campo de golfe, restaurantes, restaurantes, sorvete, mini-golfe, vários parques estaduais, caminhadas, sky diving e atrações históricas. Sinta-se à vontade para entrar em contato conosco para esclarecer qualquer dúvida adicional que você possa ter. Como nossas análises indicam, somos muito "amigáveis". Estamos ansiosos para a oportunidade de hospedar férias Vermont sua família. Perto de Burlington e Middlebury. Excelentes opções de refeições, golfe, clube, restauranting, atividades, caminhadas, ciclismo e compras todos a poucos minutos de distância do hotel. Uma brisa fresca no convés, pores do sol majestosas e peça inestimável de espírito. Localização muito sereno. Old towels, old dishes, mostly chipped, old furniture, no coffee maker, a tiny old toaster, musty house. We have a history of 4-5 star reviews and this review appears to be out of character for our "norm". We pride ourselves on providing a comfortable experience for our guests as well as being very responsive to their needs as evidenced by our reviews. As to dated furniture: To our future guests please keep in mind that our furniture is super comfy and each guest has their own individual tastes and expectations. We certainly hope this meets yours. As to musty.......with all due respect.....not a chance. To our future guests, we always request a call about an hour or so after you have arrived at the property. We find this gives you time to explore the property and we can address any questions and/or requests you have at that time. To our future guests, we look forward to the opportunity to host your Vermont getaway. Wow, just wow. Great BBQ's on the deck. Easy access to the water. They even had kayaks and bikes for us. House was very spacious and clean. Having laundry on site was a great benefit. Owner was very responsive and easy to deal with as well. 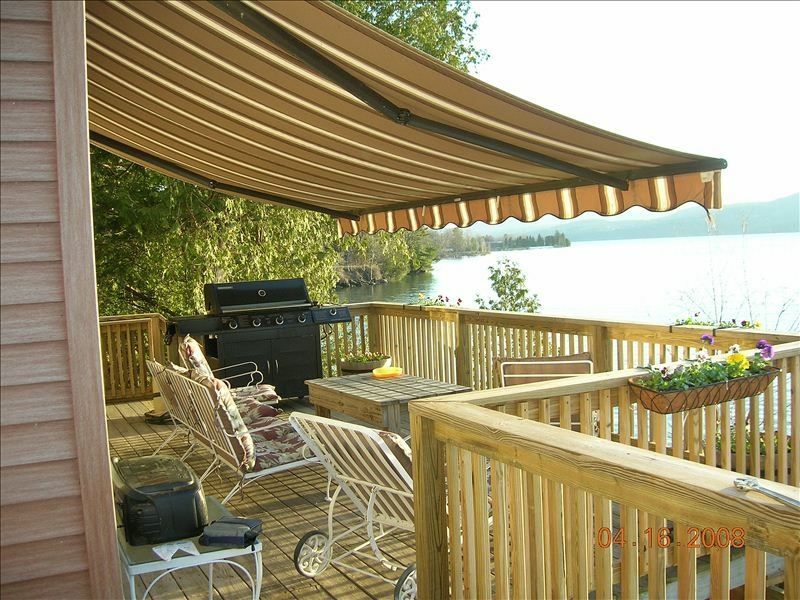 Comfortable and quiet property with a gorgeous lake view! What a view! This place was the perfect spot for my group of ten. Although we came here in the middle of winter and the lake was frozen over, the sunsets and sunrises more than made up for it. The property had an abundance of beds, and everything was very tidy and well kept. The only issue we had was that the wifi was so slow that we weren't able to use it. Marty was an amazing and responsive host and we will definitely look forward to coming back again. Luxurious, tastefully decorated and a true slice of Vermont. We absolutely loved our stay and the fireplace was a nice touch. We skied during the day and cooked at night......even hit a couple of breweries and restaurants. Property was large enough to give each their own space with plenty of room for us to gather together as well. We are looking forward to coming back in the Summer to enjoy the beach and water. I rented this property for a group of friends to do some relaxing and fishing. The amenities were just fine. It was clean and the sleeping arrangements were good for the most part. My only complaint was that it really didn't suit our party for the its intended purpose as well as we had hoped. The parking for trucks and trailers was very limited, the nearby boat launch is really only good for the spring season, and the dock is also only good for short term use and best in the spring when the water is high. (we did know about the dock ahead). Luckily the state launch is only a few miles down the road, so we managed. The house is on the small side for 12 people compared to many others I have rented, but it was sufficient. We did have a great time, and would recommend it to friends with a slightly smaller party and no major fishing/boating plans. Many of these downfalls I take responsibility for, as I should have asked a few more questions. I would say that the Owner should be more forthcoming with the parking situation, as we were told this was not a problem and ultimately it is ample for parties with one or no boats. Other than that, he was VERY accommodating for an early check in and pushing checkout out a bit (9am is fairly early). This was a huge benefit and we are grateful for it! 2018 check in will be at 4pm and check out at 10am. Therefore, allowing a bit more time for our renters in the morning. The decks are definitely the selling point of this property. Being right on the lake at the end of a dead-end road is delightful. Sufficient bathrooms and beds for a large party. The kitchen was very well-equipped, plenty of service ware, Tupperware's, kitchen odds and ends. The appliances are new and well functioning. A larger toaster would be nice,perhaps a toaster oven. Air-conditioning's in every bedroom is a nice feature. Lots of TVs. I don't feel like they are necessary but some might like that. Plenty of towels, linens, blankets. It's very nice to have a newer washer and dryer on hand. Easily enough parking for 6 cars. Very peaceful being on a dead end. Very conviennent to have trash and recycling receptacles on site. Kayaks and paddle boards are great to make use of the lake. I would highly suggest getting a dock that can be used at all lake levels. We would have really enjoyed having the use of the dock. The house is spacious and has enough separate areas for people to disperse and take naps or get away. It would be really nice to get rid of all the carpets. It would make cleaning up easier and make the place feel more clean and new. It is old carpeting that needs to be replaced with wood or tile, especially in the bathrooms. The property could be easily enhanced by getting rid of some very dated and over abundant furniture. You wouldn't need to get anything fancy just freshened up. The upholstered dining room chairs are far too bulky and ridiculous. There is no need for desks in the bedrooms. One of the rooms has a very nice quilt spread which would be lovely to have in all rooms in exchange for the current comforters. The beds are very comfortable. The deck could use a new coat of stain. Having a general store and ice cream shoppe nearby is a nice perk. With a few small improvements this house could be top notch. Pára-quedismo, caminhadas, ciclismo, mini-golfe, stands de sorvete etc. Rates are subject to change until confirmed. All rates represent base rates and additional charges may apply based on the number of guests in your party. Cleaning Fee $200 for < 4 guests. Cleaning fee $250 for > 4 guests. VT Rooms & Meals Tax 9% Thanks and enjoy your stay!